ABS-CBN Publishing, Inc. sets the stage for two of today’s youngest breakout stars during this month of hearts, as fashion lifestyle authority Metro magazine’s biggest trends issue features Julia Barretto and Chalk’s Valentines special features Liza Soberano. 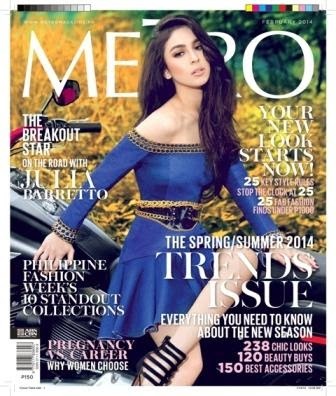 In Metro this month, teen royalty Julia, who is set to star in her first primetime series, “Mira/Bella,” is put under a different sort of spotlight—revealing how she goes beyond her name and comes into her own in a shoot and story that details the fierce and stylish young celebrity she is with hints at who she is bound to become. Metro also features the biggest trends for Spring/Summer 2014 in its February issue, recognizing the dawn of a new season--with new collections, new trends, and a new attitude to go along with it all. The February issue of Chalk shows the newest cover girl Liza all dolled up in her date-ready ensembles. She walks the magazine’s readers through her bright start in show business. Get smitten by Liza’s undeniably au naturel sweetness and charm in an exclusive story that shows why what awaits her is something that everyone should watch out for. Chalk’s February issue also goes into ways to get that perfect “love glow,” with tips on how to put everything together in the best way to create an affair to remember. Get the lowdown on date-worthy ensembles—plus dating tips and fool-proof recipes perfect for two.